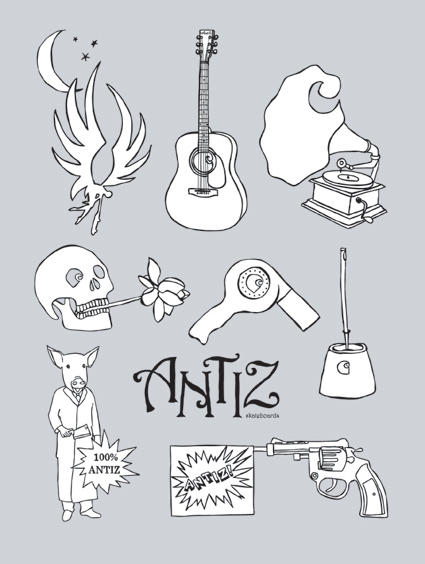 From selling boards out of the trunk of Hugo’s old Peugeot to having a huge series of models distributed all over Europe, friendship has always played a big role in ANTIZ. Even nowadays the team, touring, business is done by those friends who dedicate themselves to their vision of skateboarding and rather enjoy their freedom and be with their friends, sleeping on the floor whilst touring, than skating for one of the big boardcompanies with fat paychecks. After all these years of friendship between carhartt and ANTIZ and sharing 5 teamriders, we decided to do a cooperation series. Limited to 250 pieces per Board, carhartt and Antiz Teamrider Benjamin The (www.createavitea.com) painted this amazing series. Meet Ben himself, whose heart is gonna fly out to the sky over Annecy, Julian Dykmans flushing himself down a toilette in Barcelona, Tom Derichs picking flowers on a Wuppertal railway, Hugo drying his Iro in a bathtub in Lyon to Julian Furones who wants nothing but the stars on a rooftop in Leon. Each of these wonderful boards came with a nice stickerset, also designed by Ben.